Are you looking to achieve PeopleCert certification and become a certified professional? We have good news for you; we have a solution, which can help you clear the PeopleCert certification. We are here to assist you in achieving your goal by using our online certification practice exam platform. With tons of experience in the field of Project, Programme & Portfolio Management and IT Governance & Service Management, our team of expert has designed these practice exams which simulate actual PeopleCert certification exam environment. We recommend you to use our online PeopleCert certification practice exams for your test preparation. These practice exams will help you to validate your knowledge and identify the areas which need improvement, it will make you familiar with PeopleCert certification exam pattern and question format. The PeopleCert certification enhances your skills and knowledge by exposing you to real-time business scenarios and case studies. The most important value PeopleCert certification adds into your career is the endorsement from the PeopleCert that says you know what you are doing. At this price, there is nothing available both online and offline. Plus, the questions to practice are premium and very very recently thanks to the updates that the question bank gets on regular intervals. 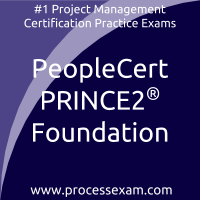 Clearing PRINCE2 Foundation certificate exam with good scores did not seem to be tough thanks to the practice through PeopleCert PRINCE2 2017 Foundation mock tests. PeopleCert ITIL Foundation Certification exam cleared with the help of Multiple Choice Questions and mock tests that i found online. PeopleCert PRINCE2 Foundation Certification exam is now cleared and i have still saved the copy of personalized result book that i got online with mock tests. I cannot thank the PeopleCert PRINCE2 Foundation mock test enough. They have helped me raise the corporate ladder by helping me clear PeopleCert PRINCE2 2017 Foundation certificate exam with good marks at first attempt itself. After clearing the exam recently, i got many good opportunities in the industry. Yes, I did it. Thanks to the site processexam. What a good site. 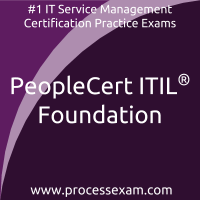 It is very excellent for preparation of PeopleCert ITIL Foundation Certification exam.